Another busy and productive day for the Grades 1 and 2. After the morning assembly, it was French class. Next, I checked agendas and we had our calendar activities and songs followed by snack and sharing. Following recess, I read aloud “Franklin the Superhero” and then we discussed ways people can be selfish and selfless. The students had many excellent real-life examples of ways they have been selfless (especially with siblings). During math, we continued our lessons on money. 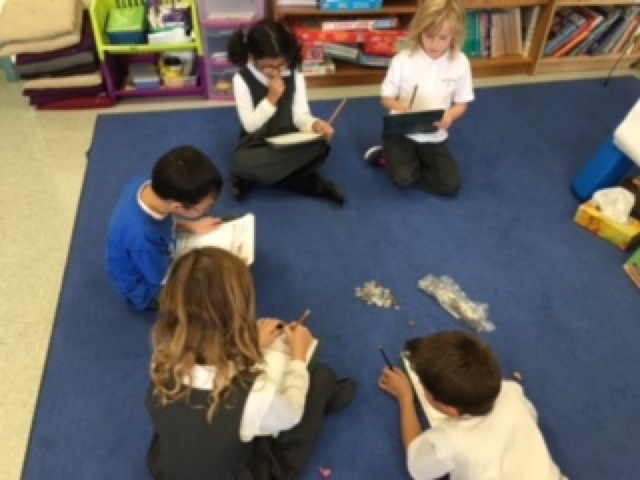 Again, we used play money to count, group and sort and then students worked in groups for their challenge activities. Following lunch, it was time for reading groups and work to complete catch up. The “blueberries” completed their current story today and will begin their new novel tomorrow. After last recess, it was time for UOI. Together we read a dinosaur fact book about specifics regarding herbivores/carnivores and ways that herbivores had to use their body/skills to escape carnivores. It was a lively discussion! Reminder that tomorrow is spelling dictation.